OUR CLASSES Yoga Therapy Our yoga therapy classes is perfect novices who wish to begin their practice but feel intimidated. It is also a great fit for those with orthopedic limitations who will benefit from the gentle flexibility work. With an emphasis on breathing, this class is designed to leave you feeling relaxed and refreshed. A guided meditation concludes each session. Restorative Yoga This gentle practice restores mind, body and soul. Melting into each restorative posture participants passively dissipate physical and mental stress for a truly renewing experience. Power Yoga Flow This dynamic class offers participants a challenging and vigorous physical workout. The flow of Asanas joins together the breath and movement through a series of postures. Regular practice increases muscle tone as well as fluidity of movement. 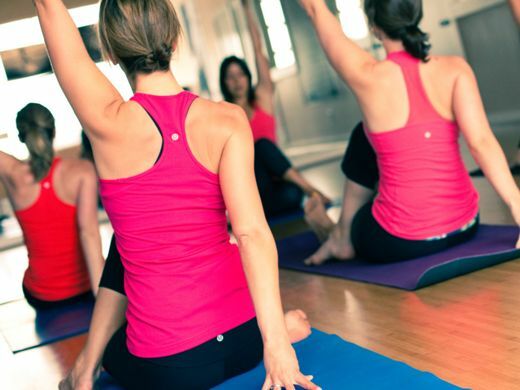 Consistent with our long history of premium services delivered with care, Fitness Advantage Yoga classes offer quality, client-centered instruction in a beautiful restorative environment. Classes are limited in size to provide a more spacious comfortable exercise environment and to allow each participant to have a more personal learning experience. Our 1400 sq foot classroom features a beautiful bamboo wood floor that is not only beautiful to look at, but represents FA’s commitment to helping the environment. Bamboo is an easily grown renewable wood. By choosing Bamboo and avoiding the use of traditional hardwood floors like Maple, which take decades to grow, FA hopes to make a small contribution to the environment. Please call Fitness Advantage for class times and availability.